This Tutorial is optimized for using with VSL's First- and Pro Edition and for all the Horizon Products. Take into account that you use a Sample Player such as HALion from Steinberg, Gigasampler or the Sample Player of Logic for playing the samples of Horizon. You also need to use the so called "Performance-Tool" (VSL) for the legato samples. How to use those Performance Tool? Please take it from the manual of it. All the next steps are based on this Midi-file: Midi tempo 120 Vel 64 . If you want load it down and import it into your sequencer, do it. It contains just the notes you see in the score below. This is always the "Note-Level" itself ! Now you are prepared to load the first samples with your sampler. I have decided to make a track for the solo violin. A flat and "samply" sound, isn't it? And in reality? No tone sounds like the next one. If you want to come close to this natural sound you need to have hundreds of variations. This isn’t possible. But VSL offers plenty of different tone variations. Example? It is up to you to decide how close to the reality you want to be. A rule for practice: The more instruments you have the less different samples per instrument you need… So if you want to play a solo violin sonata you will need probably all available samples. You have to decide whether you want to come to a compromise or not... > More different samples or less. With the string instruments stac-1 means up-bow and stac-2 down-bow. For woodwinds and brass instruments stac-2 is "only" an other stac-tone. So load now the stac-1 and stac-2 samples. Important: The channel-setting of the sequencer should now set to ALL! (not Ch1 or an other single Ch). So your sampler is able to play the samples which are laid on CH2 and Ch3 too. See to this subject the picture rihgt to this text. Clicking on it will enlarge it. As you can see in the score we take for d in the second bar the 0,5s-sample. It has a nice sound. You will see it later on in a better way (when this sample will be played with ff). You have to load up the 0,3s–sample too. Both sample-types you will also find under "soloViolin_Short_Notes". To get the real violin sound we have now to load up more samples. Most time it is a good thing to combine the sfz-sample with stac-samples. Example: You have a quartet of 4 1/8 - notes. Usually the real violinist plays these four notes in different ways. One possibility: He plays the first note with more "weight". So in VSL-language means this: “sfz - stac-2 - stac-1 - stac-2 ... “ try it out. We will play in our example the very first note with sfz. The end of our track we play with to different dim-samples: ohne Vibrato (without) / mit Vibrato (with). Attention: There are dim-samples with one velocity-level and those with two levels. Dims with 2 levels have the following letters _dim2_3s. The 2-level-dims are good for p - ends. Important: Performance Tool CH 1 – CH 8 and CH 11 – CH 16 should be switched "thru". 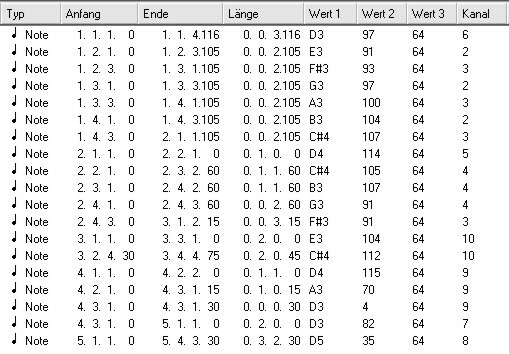 So the signals for all our other (non perf) samples can pass through. I created different types of VSL-sample-instrument-sets for all instruments with HALion. So you have a fast sample-uploading with always the same sample-configuration. Further on I created a useful standard (which channel / which sample) for every type of “instrument set”. A very important thing is the adjusting of the velocities. There are no rules for the velocity "calibration". On the one hand you have the composer’s fortatos and pianos and on the other hand you have the limitations of the VSL-samples. So try, turn, trim, increase, decrease, check, change... until you have the best result(s). The examples in step 3 and 4 are already “velocity adjusted”! 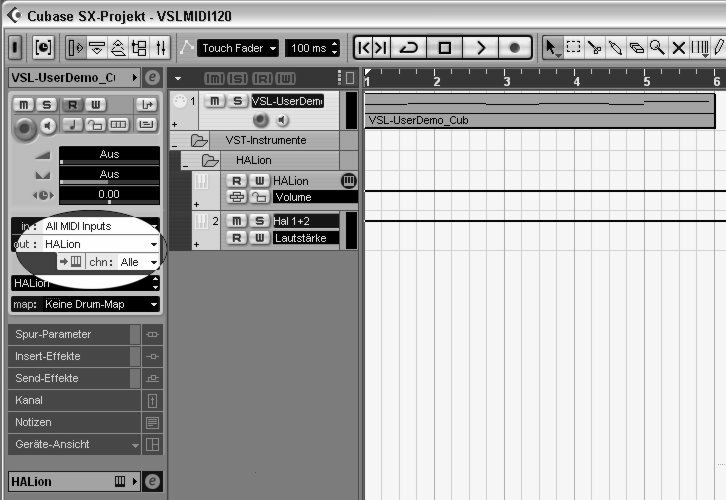 This completes the first introduction in "How to use VSL (Midi)". Without batting an eyelid you will use 10 different samples for creating a real sound of an instrument. As a composer you want to have perhaps up to 10 instruments in the meantime beside you. I think this situation uses more than one PC / MAC. With a "0,7s preload into ram" I used 300MB - space (for all samples Ch1 - Ch10). That means: For a string quartet = 4 x 300 MB = 1200 MB - ram space. This means also four instanstances of your sample player with its loaded samples for violin 1, violin 2, viola and cello ... Because I produce mostly mock-ups I prefer to create instrument by instrument... just I've showed it now. Zugriffe heute: 1 - gesamt: 6614.